Does the dark-haired chica in the upper right look at all familiar to you, new(ish) webcomic reader? I sincerely doubt it, unless you have an amazingly good recollection of characters with cameo appearances in the early stories from Empowered vol. 1. Then again, Emp fails to recognize her as well—and she has less of an excuse, given that she met the character in the flesh, as opposed to the reader only briefly glimpsing her as a low-resolution pencil drawing. Well, worry not, as you’ll soon be clued in as to where she previously appeared and, more importantly, the context in which she met Emp, which leads to problems for our heroine. 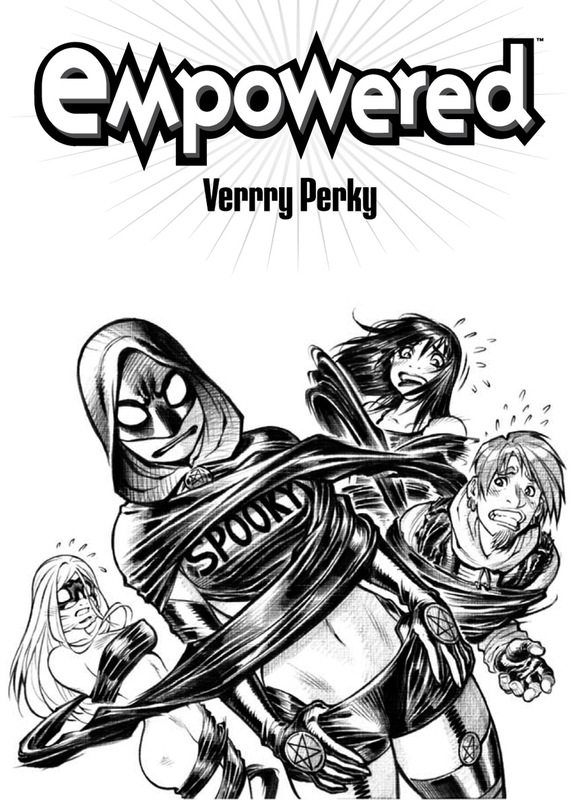 Speaking of problems, “The Aryan Ideal of Shoulder Candy” proved to be a notably problematic episode in the Empowered oeuvre, for reasons I shall no doubt discuss at length. A key—if idiosyncratic—element of the Empverse, the so-called “Unwritten Rules” governing interactions with suprahumanity, came about directly because of this story—though too late to spare our heroine from from some seriously inappropriate interactions. To be honest, I might’ve considered spiking this story outright from this webcomic serialization, save that it introduces some fairly important characters and concepts. The lesson, here, for comics artists? In most cases where a human figure is cut off and obscured by a visual element or a panel border, you’re strongly advised to draw a fully intact version of the figure first, either on the initial rough or on a separate piece of paper. Otherwise, glitches or outright disaster may well result, my presumably young(er) padawan.